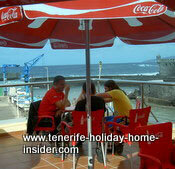 Tenerife tourist attractions by rooftop restaurants or bars. There are all sorts of Tenerife tourist attractions you may not have thought about. Just lately, the market seems to have discovered that roof top restaurants and bars may be part of them. This is all because people are not allowed to smoke inside public places any more. So rooftops are in vogue now. They are more than a must for romantic vacations or just for special occasions. 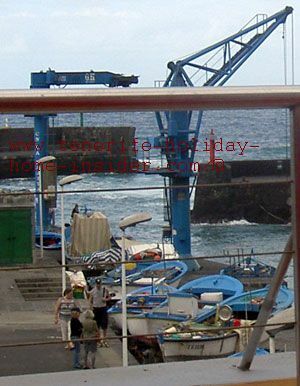 It's lovely to gaze at traditional fishing boats that are part of an idyllic roof view towards the romantic, old Muelle the former fishing harbor of Orotava. The place featured is the Tapas rooftop restaurant Cayaya which is also found under the Category of cheap Tenerife restaurants. Better ocean, mountain and city views as well as sundowns. for outside meals 'al fresco', in summer 2011. More privacy for celebrations of small family events, such as birthdays or similar events. where good roof restaurants are nearby. 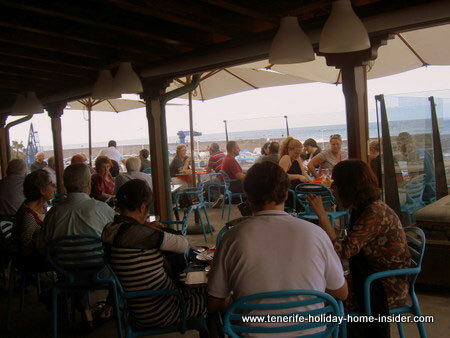 Bar Alberto of Tenerife bars is not on a roof but, it competes by its breath taking veranda lookout high above Puerto de la Cruz. My unforgettable Easter 1997 vacation with the Hotel Valle Mar Puerto Cruz rooftop with great views of Martianez pools, San Telmo and more. This roof terrace with swimming pool under the clouds is even more attractive now. A most stunning Orotava roof veranda is shown above. It belongs to Hotel Rural Victoria. It's my second favorite hotel rooftop, as it's so laid back. No pool is there but, absolutely breath taking views of a Spanish town of the finest by the deep blue sea. Also ask Richard Etherington who is one of best Tenerife hotel chefs to send you some delicious food to the roof. Monika Sur hotel azotea by the South airport. From Tenerife tourist attractions back to Tenerife attractions which are numerous and offer unforgettable scenes, thrills and adventure to the whole world.